With a growing number of marketing applications available, marketing teams are struggling to see differences among them. Meanwhile, IT teams are bogged down with development and maintenance requests to migrate or manage the use of multiple platforms already in use. Gartner’s 2016-2017 CMO Spend Survey found that marketing departments are spending 38% of their tech budgets on external development services and cross-charges from internal IT teams. Strategic marketing and IT leaders are looking for ways to streamline technology and eliminate solutions that limit integrations and scalability. 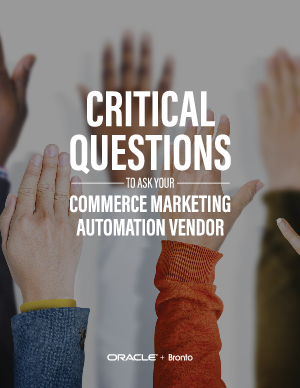 It’s important to look at the resources required to maintain the marketing applications you use and compare them to other options available in the marketplace. Choosing a marketing technology partner is a total-revenue-performance decision. Ask questions about integration and scalability. Find partners whose marketing automation is built to scale with your business, and select vendors whose teams provide the critical support and services you’ll need along the way.